This article appeared in the print edition of Club Business International in June 2018. Colin Grant was destined to be a fitness entrepreneur. After moving to Hong Kong with his family at age 10, he played semi-professional tennis—in the Davis Cup, Junior Wimbledon, Junior U.S. Open, and Junior French Open. As a teen, he founded start-ups in the tennis, entertainment, and coffee businesses. 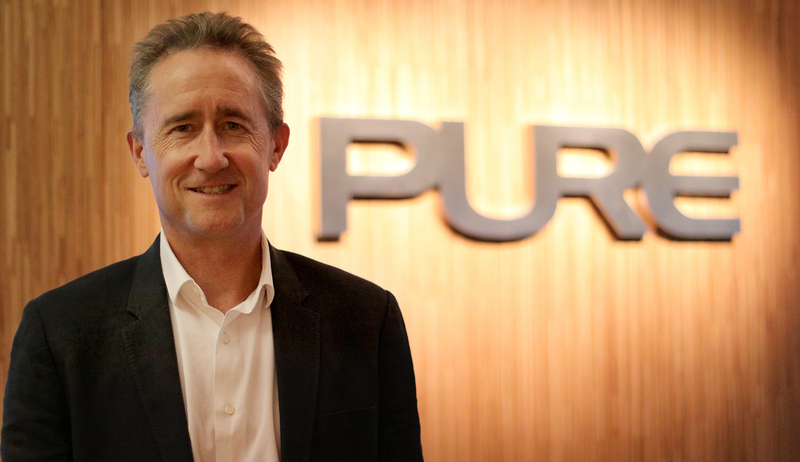 In 2001, he cofounded the Pure Group with Bruce Rockowitz, his friend and business partner. They opened the first Pure Yoga studio in Hong Kong in 2002. Today, the company is a successful lifestyle brand with 35 Pure Yoga studios and Pure Fitness clubs in Hong Kong, Singapore, Taipei, Shanghai, Beijing, and New York City, with 1,900 employees and 80,000 users. In December, Pure received investments from FountainVest Partners, a private equity firm based in Hong Kong, and the Ontario Teachers’ Pension Plan, to fund its future growth. At least five more sites are scheduled to open this year. The Asia-Pacific region is ripe for growth, according to IHRSA's Asia-Pacific Health Club Report, and Grant's success highlights the potential. CBI: Hong Kong is your adopted home and where you developed the Pure Group, a chain of successful yoga studios and fitness facilities. To start with, please tell us how you came to live there. COLIN GRANT: I was born in Nigeria. My mother’s British, and my father’s from New Zealand, a Kiwi. He was a civil engineer, so we traveled around, and were posted from Nigeria, to the U.K., to Iran. In 1977, when I was 10, he was sent to Hong Kong to work on the underground for six months. Now, 41 years later, the city is very much my home. I married a local girl, have two daughters, and, over the last 16 years, have developed Pure. I feel very settled and grounded here. CBI: We understand that you look back on the birth of Pure as a fluke of luck and timing. Tell us more. CG: In 2002, I was on a golf holiday in Canada, but, since it was raining, someone suggested that we try a yoga class. If that had happened a year earlier, I wouldn’t have done it, but, for whatever reason, I was open and willing. I remember it clearly: it was a 90-minute hot class at four o’clock on a Thursday afternoon. I’d always exercised, I’d always gone to the gym, but that class was a totally different experience. I felt it physically, mentally, and emotionally. My head was clearer, and I felt lighter. So, the next day I canceled golf and, instead, did yoga. When I came back to Hong Kong, I discovered that there were only three or four yoga studios, serving, perhaps, 50 students a day. It didn’t make business sense, because, back then, yoga really wasn’t a business. It just felt right. CBI: You’ve been entrepreneurial since childhood, so creating a new company wasn’t exactly new for you. CG: That’s true. When I was 12, I became an agent for a West German brand of tennis racquets and skis. I found out, the hard way, that they made better skis than racquets. But it didn’t deter me. Next, when I was 13, I bought my own racquet-stringing machine. Then I started Movieland, a movie rental business, in 1985, when I was 18. In 1991, we introduced Mr. Bean Coffee, and planted highly successful, revenue-generating kiosks throughout Hong Kong. But, by 2001, I was looking for something new. With my friend, Bruce Rockowitz, who’d been on that golf holiday with me, I decided to invest $1 million in our first yoga studio. The birth of Pure was the result of our being sports-minded, entrepreneurial, yoga enthusiasts, with the necessary capital, and willing to take the risk. Today, we have two major brands, Pure Yoga and Pure Fitness. Bruce serves as chairman of the group. CBI: Why did you take that risk when others might not have? CG: To me, doing business has always seemed quite natural. If things don’t work, the sun will still come up tomorrow. But I don’t want to regret not having tried. Tennis, I think, influenced me in a huge way. I started competing in tournaments when I was 8 or 9, and began playing semi-professionally when I was 11. I’d go out on my own and play another kid. I had no support—that forced me to make decisions and think independently. If I lost to somebody, I may have learned, in the process, that maybe my backhand was too weak. So, I’d practice. The next time, I’d beat the guy. In my mind, you don’t fail. You learn from your mistakes. If you’re not making mistakes, you’re not pushing the envelope, you’re not innovating. Just don’t make the same mistake twice! Tennis and playing competitive sports have shaped my work ethic—how I approach problems and how I deal with people. They’ve had a profound impact on how I look at business in general. CBI: In what ways did your first site, in The Centrium, Central, in Hong Kong, differ from the other yoga studios of the time? CG: For one thing, people had to struggle to find them. They’d be down an alley and located in a space the size of a small meeting room. Students had to bring their own mat and towel. We went into a brand-new building with a 6,500-square-foot studio. We didn’t know, at the time, that it was the largest yoga studio in the world. It had a beautiful lounge, a nice reception area, and changing rooms with lockers—which were unheard of back then. We provided showers and mats and towels. We started with 67 people the first day, and, within a month, we were attracting 400 a day, with minimal advertising. CBI: Why do you think that Pure Yoga took off as it did? CG: Yoga sold itself. It’s based on phenomenal practices that evolved over a period of more than 5,000 years, and we mainstreamed it. We provided a convenient, attractive, and very comfortable environment, and very good teachers. It was totally new, and, when people took a class, they felt great. Today, we offer 30 different types of classes across Pure Yoga. CBI: How has Pure Yoga itself evolved since that first studio? What’s it like today? CG: A lot has changed over 16 years. In 2002, our yoga clientele was 90% female, 10% male; now, it’s 80% female, 20% male. We have 20,000 people exercising throughout the group. That first studio is still open, and now encompasses 10,000 square feet. One of our newest locations is, at 35,000 square feet, more than three times as large, and attracts 1,500 students a day. We offer beginner, intermediate, and advanced classes. We have one-hour, 90-minute, and two-hour classes throughout the day. We have workshops, intensives, group classes, one-on-one, and small-group private classes, and conduct retreats in Bali, Thailand, and Sri Lanka. As of this summer, there’ll be a total of 35 locations under the Pure brand. That includes 22 Pure Yoga locations worldwide—11 in Hong Kong; four in Singapore; two each in Shanghai, Taipei, and New York City; and one in Beijing. CBI: What are your membership fees? CG: There’s a one-time joining fee, and monthly packages that run from about $113 per month, which grants members the use of a single location and unlimited visits and classes, to a 24-month contract, at approximately $190 per month, for access to all of our Pure Yoga studios and Pure Fitness clubs in Hong Kong, Shanghai, Singapore, and Taipei. People also can opt for short-term contracts of one month or three months or pay our “drop-in” rates. CBI: You’ve mentioned the importance of having good teachers. How do you find the right people? CG: We do our best to attract them. Since we started, we’ve made becoming a full-time yoga teacher a real possibility. In addition, we’ve created a platform that allows teachers to grow as we do—there’s teacher training, a scholarship program, and regular meetings to cultivate a sense of community. We also give them the option of teaching group classes, workshops, private classes, and retreats. We make sure that we’re the employer of choice. While we hire for experience, personality matters the most. We seek instructors who can make each person in a class of 50 feel as though they’re the only one in the room. CBI: You also have two Pure Yoga studios in New York that are run by Equinox. How did that arrangement come about? CG: Eight years ago, Equinox was looking at getting into yoga, and they recognized that our experience could help them. They build beautiful studios, and we’re very happy with what they’ve done. But we’re focused on Asia—we have enough to do here. CBI: Let’s turn our attention, now, to Pure Fitness. What prompted you to diversify, to segue into fitness, a more mature market? CG: We felt that yoga was becoming more and more popular, and that offering yoga and fitness, side by side, represented a complementary approach. When you have 700 people practicing yoga, many of them have partners who prefer to go to a gym; and we also had people who wanted to do both yoga and fitness. It seemed to make sense to add fitness facilities. In Hong Kong, however, we’ve done it differently, creating a premium experience. We thought, let’s find a good location, spend more on the interiors, offer a member’s lounge, and provide towels, clothing, and free apples on the counter. Plus, DVDs so that when members are on the cardio machines, they can entertain themselves. But if someone’s having a good experience—they value it. And if they’re getting healthier—they’re willing to pay for it. For example, our facilities offer state-of-the-art equipment, personal training, and TRX, Les Mills, and many other types of group exercise classes; the world’s first 270-degree Immersive Fitness studio; and Asia’s first RealRyder indoor cycling studio. Today, we have 12 Pure Fitness locations—eight in Hong Kong, three in Singapore, and one in Shanghai. We also operate a hybrid yoga/fitness center in Hong Kong named Pure South—The Pulse. CBI: What are your expansion plans? How will you fund the Pure Group’s future growth? CG: Last December, we received an investment from FountainVest Partners, a private equity firm based in Hong Kong, and the Ontario Teachers’ Pension Plan. Bruce and I are shareholders in the business, and we’ll continue to run the company, but we’ll draw on the experience FountainVest has had with 24 Hour Fitness and GNC’s health and wellness products. We’ll continue to grow in Hong Kong, even though the rents are high, and we’re not small—our yoga studios average 12,000 to 15,000 square feet, and our clubs 25,000 to 30,000 square feet. We’re interested in the central business district, with its major transport links. We’re also looking at sites in Singapore. That, to us, is a strong market. Penetration is still low, at 4.2% to 4.3%. And China—that’s a huge runway, but it’s going to take time to develop. We opened our first yoga studio in Shanghai in 2013, and our second in 2016. There’s no urgency—I’d prefer to be six months late in China rather than six years too early. CBI: As you continue to expand, how will you ensure that your offering remains true to form? CG: That’s the challenge. Every day, I talk to my guys, and tell them that we have to act like a small, nimble company. Bureaucracy, red tape, and different corporate layers—I’m making sure that we avoid those things as we grow. Just because we’re bigger, and offer yoga and fitness to more people, doesn’t mean that we’re any less passionate, or less focused on providing an amazing experience. In fact, we should do a better job because we have strong financial backing, a customer service director, and a new retention manager. Our attrition rate is 2.5% a month. Not bad! As we grow, we’ll continue to offer a personalized experience. We’ll utilize more technology, such as our own app, to create member profiles based on their usage, the classes they take, and their favorite smoothies. Then we can suggest other things they might like. CBI: Looking forward, what do you see happening, generally, with respect to fitness trends? CG: Increasingly, people are realizing that healthy lifestyle habits are the secret to a long and happy life, but they’re also beginning to prioritize things in addition to exercise—sleep, diet, meditation, wellness. I went vegan two years ago, and it’s resulted in a complete mind-shift. I expect to see more of this kind of thing happening in the years to come. I also think that, increasingly, studios and clubs will become social hubs. People don’t want to do a class and, then just leave. They want to read a newspaper and relax with friends. They want more than exercise. They want to live a healthy life. Gale Landers’ business algorithm has turned Fitness Formula Clubs into one of Chicago’s dominant health club chains. Catherine Larner is a contributor to Club Business International.